Editor’s note: This is the fourth post in our advice column (read the first one). Have a question? Ask it here—it’s completely anonymous. Am I overreacting, or are you too happy to see me? No-longer-potential-employer (let’s call him Sam) messaged me on Facebook regarding an art director position at his company. The interaction was uncomfortable and he said a few things that, in hindsight, should have triggered my “ding ding ding he’s a super-creep” alert. But, you know, clients. They can be weird. I let it go. We scheduled a meeting for the next day—at a cafe, not in the office (at Sam’s insistence). When I got there we shook hands, sat down, ordered our coffees, and opened the laptops. But then I felt something weird on my leg. I went to the bathroom to compose myself and then told him I’d gotten an SOS phone call and had to jet. I haven’t been answering his calls or messages since—but that doesn’t seem like enough. First of all: I’m so sorry. You have every right to feel angry, hurt, disgusted, betrayed—but don’t think about the red flags you didn’t see. It’s not your responsibility to tell people to maintain their decorum. With that being said, let’s talk about red flags. For the future. Potential bosses/clients should, whenever possible, meet you in their offices. If not, they should bring someone else with them. PBCs should keep Facebook/Whatsapp/SMS communication to a minimum. It’s not their medium. Schedule a meeting and move it to email. PBCs should keep everything PG in every way imaginable. Your communication should be Ayn Rand-level practical. You’re not pals—at least, not yet. PBCs should never, ever touch you beyond a tap on the shoulder or a very brief hug, if that’s normal in your culture. PBCs should keep all initial meetings alcohol-free. Meet your crew for drinks, meet your PBC to get that $$$. Freelancers and job seekers put up with a lot of garbage, in part because we’re our own HR departments, in part because our jobs depend on our reputation, and in part because, well, we do. When something like this happens, it often feels like there’s nowhere to go but to a friend’s (hopefully) sympathetic ear. There are clear boundaries, though, and hand-on-the-inner-thigh totally crosses them. But, when it’s that obvious, you have options. You’re not taking it too seriously. You’re taking it just seriously enough. Go file that report. You said the Facebook interaction felt weird. How weird? Weird enough to bring with you to HR when you call them and tell them how creepy Sam is? Chances are, you’re neither the first nor last potential art director that this creepbro has tried to feel up. You have the power to keep him from doing this to others. Does Sam’s company have an HR department? If so, you have a clear point of contact: send an email explaining the incident (and including screenshots of the Facebook correspondence), and ask how to proceed. If they don’t respond, try again. And again. If Sam’s company doesn’t have HR, like many smaller companies, then this is trickier. Does Sam have a boss? If so, they’re the go-to. If Sam runs his department, I’d suggest going right for the CEO. Let’s be real, though: don’t expect a ticker-tape parade from Sam’s company. We live in a world where sexual assault (and that’s what happened here) is often taken lightly. Assuming you get an answer at all, you’re probably going to have to deal with a lot of crummy questions. Why were you Facebook messaging in the first place? Why did you agree to meet at a cafe? Is it possible you sat on his hand? It’s a lot easier for HR to interrogate you than to have a difficult conversation with one of their own. But, Grossed Out, you’re in the right. And you’ve got to stand tall. This is where the police report will help. Some official paperwork will show that you’re serious about getting Sam out of the interviewer’s seat, and into a windowless office with no outside contact. If you don’t feel like going through with this, I get it. It’s your inner thigh that got touched, and it’s your decision how to let the world know that Sam is gross. If you do choose to go forward, though, I support you. And a lot of people will be very grateful—whether they know it or not. One thing that you absolutely should not do, just to be clear, is blast him on social media. It’s tempting, and he deserves public flogging, but that can send you to jail or court-imposed fine city reeeeaaallll fast. Talking smack on the internet, though we all do it, is technically libel. Which is a big ol’ crime. If he goes to the police, the one getting into trouble will probably (definitely) be you. Be strong and be smart. How many designers make up a design stack? Basically, you name it, I’ve tried it. I’m ready to take the next step, but I’m not sure exactly what I should do. On one hand, I know how to do a lot of things, but on the other hand, I’m not sure that I’m excellent at any of them. Basically: I want to make more money. How do I get this design show on the road? One Girl, you’ve got it going on. Let’s take a moment to bless up your multitalented self and your motivation to move on and up. Now, let’s get into it. There’s a lot of ways to start making more money, and the easiest and fastest one is to start asking for more. But there’s an art to this. If you walk into your manager’s office tomorrow and tell them you want a 20% raise or you’re out, you’ll probably be out. That’s not the art. What you’re going to want to do instead is create a new name for yourself. From what you’ve told us, you’re all set up to be a full-stack designer. Now we just have to build your stack right. 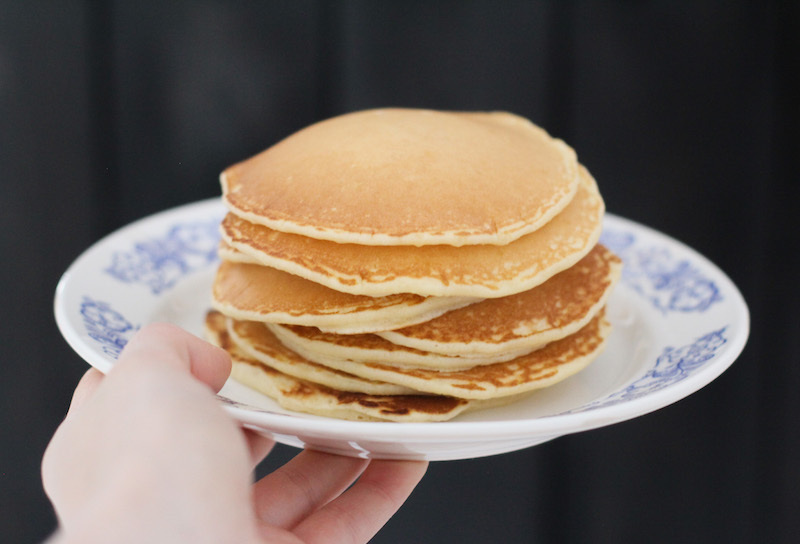 For inspiration, let’s look at the original dream stack: pancakes. Your experience, One Girl, has prepared you for this moment: the moment you decide what kind of designer you want to be. In carbspeak, what kind of pancake you want to be (or eat). You’re going to brand your stack. What have you liked about what you do? What are the projects you would do forever and always? What makes you forget to eat lunch? How can you combine your talents to provide huge value? Let’s say your jams are print design and UX. By finding a way to combine these 2 interests, making them one combined narrative, you’ll develop a value proposition for yourself that other designers can’t meet. I say this a lot, but that’s because it’s true: we’re not creatives because it’s easy. Beyond the energy it takes to explain what we do, and the fierce competition between people who should be more like family, we bear a huge mental burden that we’ve taken upon ourselves. That answer is your brand. It’s the solution you offer. We’re looking for a common thread between all of those things you’ve tried and what makes your work special, because that’s what’s going to make you $$$$. The thread, though, is you. Don’t stick to one thing. You’re clearly capable of doing more, so you should. Figure out how to make everything you love a part of you—and that you that you’re building is what’s going to bring you the new opportunities you’re looking for. It’s totally anonymous. Just ask here. How do you make the jump to full-time freelancing? Shayna is Managing Editor of InVision's design publication, Inside Design. She lives in Tel Aviv with two big dogs.